Taki & Toula had some problems being born, but they made it! I wrote this series early in 2017 and expected it to be released mid-year, but due to some delays, I’ve had to wait until now. Basically, I fired my original illustrator. Then had to hunt for a new one. It wasn’t easy. Here is a visual representation of the covers of the book so far based on different illustrators…. 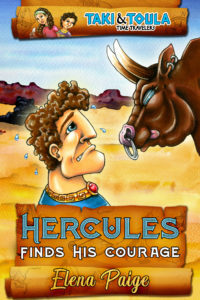 This was the original illustration for Taki and Toula Time Travelers: Hercules Finds His Courage. The comments I kept getting were that their eyes looked too cartoonish. So I asked the illustrator to improve them. They came out looking so angry! This and other reasons, I decided I needed a new illustrator. This illustrator had an inspired vision which was really quite beautiful but not really in alignment with how I saw Taki and Toula. Back to the drawing board. This illustrator had talent but kind of lacked the comedy aspect I was looking for. Great illustrator though! Then out of nowhere the original illustrator of Lolli turned back up. He had taken a break from illustration and hence I used a different illustrator for the Meditation Adventures for Kids series books 3-6. 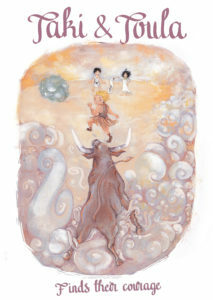 Josef Hill was the illustrator that did Books 1-2, and book 7 (Lolli & the Superfood Quest). He is very talented and his illustrations are quite quirky. He also did the illustrations for I Love Being Different, I Love Being Free and I Love Trying New Things. I’m often complimented on his illustrations. So here is the new book cover! The new book is being released on FRIDAY 3rd NOVEMBER 2017. Books 2-5 will be released early in 2018. They are Early Reader books perfect for kids aged 5-8 and parents can read along for younger children. 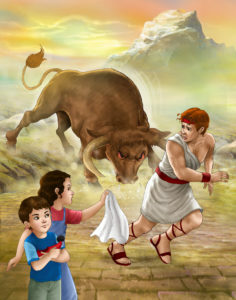 The stories are all about how Taki and Toula travel back in time and create history with the Greek gods! Lots of fun.